I love both covers. Okay, the first one might be a bit of a cliché with a petty girl being wistful and the second might be a little cartoonish but both of them cover (pun not intended) the main aspects of the book. The first cover is gorgeous. A little bit sad, wistful and hopeful at the same time. Personally, I think that the violet flowers (could they be violets by any chance?) were a great addition, somehow bringing colour, vibrancy and playfulness into a cover that would have otherwise been sort of dull, without messing up the pensive quality of the book. The second cover is something that I can actually imagine Bria, the MC, drawing. It’s a outline map of Mexico with all the important sights that she saw marked and sketched (or pencil-shaded) with exquisite detail. Along with the quintessential, anonymous backpacker girl (you’ll see why that girl is so important in the story; she’s sort of Bria’s muse). And the backpacker girl just so happens to look a bit like Bria. Coincidence, right? It all begins with a stupid question: Are you a Global Vagabond? No, but 18-year-old Bria Sandoval wants to be. 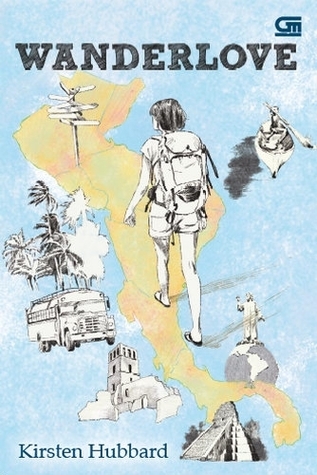 In a quest for independence, her neglected art, and no-strings-attached hookups, she signs up for a guided tour of Central America—the wrong one. Middle-aged tourists with fanny packs are hardly the key to self-rediscovery. When Bria meets Rowan, devoted backpacker and dive instructor, and his outspokenly humanitarian sister Starling, she seizes the chance to ditch her group and join them off the beaten path. Bria’s a good girl trying to go bad. Rowan’s a bad boy trying to stay good. As they travel across a panorama of Mayan villages, remote Belizean islands, and hostels plagued with jungle beasties, they discover what they’ve got in common: both seek to leave behind the old versions of themselves. And the secret to escaping the past, Rowan’s found, is to keep moving forward. But Bria comes to realize she can’t run forever, no matter what Rowan says. If she ever wants the courage to fall for someone worthwhile, she has to start looking back. Kirsten Hubbard lends her artistry to this ultimate backpacker novel, weaving her drawings into the text. Her career as a travel writer and her experiences as a real-life vagabond backpacking Central America are deeply seeded in this inspiring story. Wow! Wow! Wow! It’s hard to imagine a plot more exciting and wholesome than what this blurb promises but somehow it’s true. This book is full of new experiences, adventure, gross hotels, travel tips, art, self-discovery and second chances. It seems hard to believe that all this can be found in just one book. But this book is not just any book. Dun dun dun. This is a backpacking book. And a pretty good one too. The scenery adds to the plot and brings it from great to swoon-worthy (if you’re the type that swoons over books; and I totally am.) . Mayan cul­ture, pineapple liquitas, the vibrancy of crowded cities, the jun­gle, the humidity, the rides on the chicken buses, and the bluest waters with exotic fishes in it. Backpacking has been on my bucket list since…forever. My destination wasn’t Guatemala and Belize (it was Europe in case you wanted to know), but whatever. Same difference, right? And just like Bria, I have the tendency to overplan and compartmentalize. Thankfully not overpack though. Travel has been over-romancised in Bria’s mind. She wants nothing more than to learn how to be spontaneous. Her goal for the summer is to learn how to travel effortlessly and ‘just go with the flow’. Unfortunately Global Vagabonds, the tour group that she signed up with, is non-conducive to her goals. Every­thing is planned out for her from the walking tours to the food they eat. There’s no downtime or room for self discovery. Once an oppor­tu­nity to ditch them arises, she takes it to prove her­self to all her doubters back at home that she can do this. And to herself as well. Bria is the kind of character that evolved as the book went on. In several ways. As a traveller, she lost her fear of shabby rooms and humongous insects. As an artist, her drawings became more emotional and complex. And as a person, she tried new things, overcame several fears, regained her self confidence and started acting more spontaneously. Rowan has a…checkered past. He subscribes to a policy of wanderlove. His life used to be like a nonstop rave, with rowdy parties and pounds of…something (that is probably not bananas). But during the time the book is set, he’s on the straight and narrow (except for a few stray pranks here and there, misguiding not-so-well-travelled travellers). But seriously, other than the pranks part, Rowan was a sweet guy with a lot of travel knowledge and an interesting perspective on life. Starling was a pretty interesting character. She’s Rowan’s half-sister and alleviates her first world guilt by volunteering as a teacher in third world countries for pennies. Throughout the book, her goal numero uno is to keep Rowan happy and safe. Even if she has to keep him safe from himself. Loved, loved, loved the romance in this book. It’s an interesting pairing but it makes so much sense. I liked Bria and Rowan as friends. The way they shared their philosophies, talked about books, travelled together and encouraged each other to step out of their comfort zone. But those two had chemistry and I was really, really glad when the friendship turned into something more. The romance was so believable. Their issues were handled perfectly. All in all, I think the romance was sweet and believable. I can wait until tomorrow to call my college, where I’ll probably be sleeping on a cot in the basement, but at this point, I don’t care. When you fall for a guy like Rowan, nothing’s certain. But I’m pretty sure we’ve found the antidote to Wanderlove: each other. “Hearing about vacations is like hearing about dreams — no one cares except the person who’s experienced them.” “What everyone forgets — even me — is the people who actually live here. In places like Central America, I mean. Southeast Asia. India. Africa. Millions, even billions, of people, who live out their whole lives in these places — the places so many people like us fear. Think about it: they ride chicken buses to work every day. Their clothes are always damp. Their whole lives, they never escape the dust and the heat. But they deal with all these discomforts. They have to. And this one made me laugh because it’s just so…Bria. At the beginning, Bria comes across as sort of snobby and a bit of a brat. In fact, when she was on the plane and lied that she was a photographer, I wanted to simultaneously laugh at her, slap her and slam the book shut. Not necessarily in that order. Besides up till, like 1/8th of the book, it seemed like Bria and the author was keeping us (the reader) at arms length. But seriously, don’t give up on the book. It gets better. And once you get Bria’s backstory, all will become clear. A great summer book when you’re stuck at home. I almost felt like I was on the trip with Bria. I loved the characters and the plot was pretty good. And the cover’s really pretty. Almost like an accessory. So stop making excuses and pick up this book. As soon as possible. 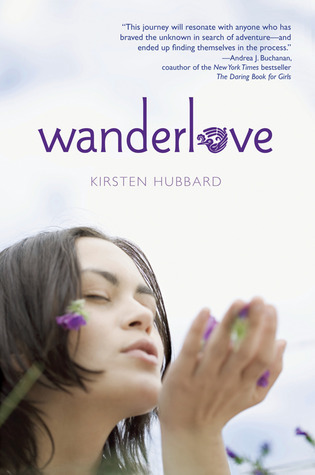 This entry was posted in Book Reviews and tagged 3 dimensional character, Belize, best young adult, book, book review, Bria, contemporary, cute romance, Gatamela, great ending, Kristen Hubbard, plotholes, quotables, review, Rowan, travel, Wanderlove, young adult. Bookmark the permalink.